Established on 1 October 1949, the Sturmgeschütz Brigade participated in Operation Barbarossa in Ukraine all the way to the gates of Moscow. In 1942 it fought on the Terek in the Ukraine and then onto Sebastopol, Yugoslavia and then Hungry. Its successes can be attributed to the numerous recipients of the Knights Cross included among its ranks. 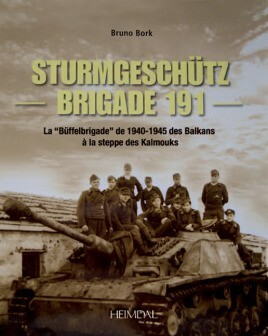 Unfortunately, due to sales rights restrictions, we cannot offer Sturmgeschütz-Brigade 191 for sale in your country. Established on 1 October 1949, the Sturmgeschütz Brigade participated in Operation Barbarossa in Ukraine all the way to the gates of Moscow. In 1942 it fought on the Terek in the Ukraine and then onto Sebastopol, Yugoslavia and then Hungry. Its successes can be attributed to the numerous recipients of the Knights Cross included among its ranks. Over 360 photographs and original pieces of documentation are included in this well researched work.